Definition at line 178 of file route.h. Definition at line 184 of file route.h. Referenced by get_default_gateway_ipv6(), init_route_ipv6_list(), and print_default_gateway(). Definition at line 198 of file route.h. Definition at line 180 of file route.h. 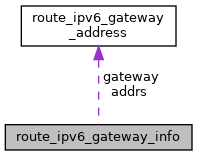 Referenced by get_default_gateway_ipv6(), init_route_ipv6_list(), print_default_gateway(), and show_routes(). Definition at line 193 of file route.h. Definition at line 190 of file route.h. Definition at line 197 of file route.h.